"Holy Family with St. Joseph holding a bowl." Do you want to buy a giclee print on cotton canvas of this artwork from Master Of Female Half Lengths ? For just a little more than a print you can have a hand made reproduction of a painting of Master Of Female Half Lengths. 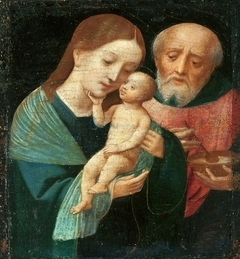 Holy Family with St. Joseph holding a bowl. Master Of Female Half Lengths - Holy Family with St. Joseph holding a bowl.